Here's a couple of gifts I made for Christmas. 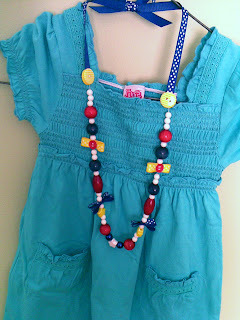 My 2yo neice has become very girly after discovering necklaces and dresses so I made her this necklace. I got the idea from one I'd seen another little girl wearing. I bought a few wooden beads and some buttons but mostly used what I had in my stock. It's funky, colourful, kiddish and fun. Apparently she wasn't too keen on wearing it until her little brother grabbed it. Unfortunately it broke in the struggle so is now slightly shorter. I wasn't quite sure that two cotton threads with beads would be very strong. Oh well. And here is the Granny Square Cushion cover I've been working on for ages. I started out making this for myself with some super fat acrylic yarn coz I wanted it to take shape quickly. That was...oh early to mid last year. I used a 9mm hook too. Anyways, when I did some possession culling in my last move I decided not to keep it but instead make it a Christmas present for my 10yo neice. I eventually got the pieces done and attached together in a row. It took me a while to get the lining right. It just didn't work as simply as I had imagined. I lined it with a scrap peice of blue/grey knitted fabric so it has a coloured base when you see the holes rather than the white of the cushion. Neat tip I got from Lucy. Also went and bought some big buttons to fasten it with. Big buttons are more expensive than I thought though. I settled for these ones coz they weren't quite as much as the others and the colours match alright. They give it a little glamour too. There is also the traditional handmade present by me for family 1st Christmases. But I'll save that one for another post. Love that cushion, really nice. And I know what you mean about the price of big buttons! I bought some last year for a cardigan I made and they were €9 each! That's about $12AUS. I nearly passed out.